In honor of Father's Day, I thought I would post a pic of a card that I pulled a while back that commemorates a father and son that both played the game of baseball. 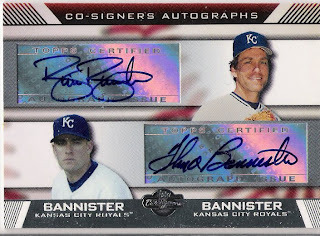 The card is a 2007 Topps Co-Signers, Co-Signers Autographed card of Floyd and Brian Bannister, both featured playing for the Royals. This got me thinking about some of the other father-son baseball combos out there. I think that the Griffeys are probably the most famous (could be a little biased because Griffey Jr. is my favorite player) because they played as teammates. Remember their back-to-back homeruns in 1990. Other father-son baseball combos include the Ripkens and Boones. Let me know who else comes to mind. Happy Father's Day to all the fathers out there. I went to my local card shop, AZ Sports Cards http://azsportscards.com/ looking for a few packs to open. 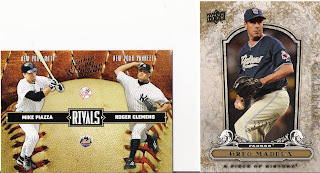 I saw some boxes of 2008 Upper Deck Documentory on the shelf and was intrigued by the statement on the box, "CHRONICLING EVERY GAME OF THE 2008 SEASON". At $27 a box, I knew it must not be that great,(in fact the owner lower the price to $25/box while I was there) but then I saw that there were some single packs available for $1.50 each and so I thought I would give it a try. I bought 4 packs. I also bought a Grab Bag for $1. I am going to post what I got out of the packs and the grab bag. My opinion about 2008 Upper Deck Documentary. I won't buy another pack. I only bought 4 packs and I have already seen several flaws. 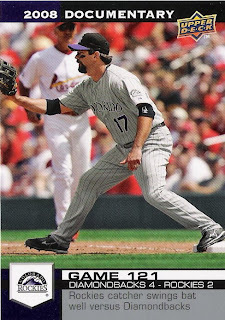 If you are going to create a card from each game played during the season, then why not have the picture on the card from the game that the card is about (see card 3570 COL121 - Diamondbacks vs. Rockies, card shows Helton at 1b, with St. Louis Cardinal 1b coach in the background). 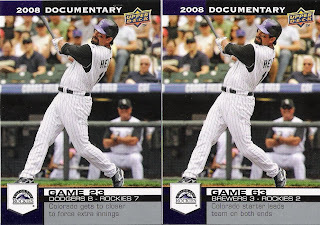 Also, I know that there are 4,980 cards in the set, but don't use the same photo on more than one card, that just tacky (see card 693 COL23 - Todd Helton, exact same picture used on card 1893 COL63). I think the concept is cool, but is anyone really going to put together an entire set. You would have to buy at least 15 boxes to complete the entire set and that is if you didn't get any doubles. I wouldn't mind putting a set team set together (Arizona Diamondbacks), but I'm not going to buy boxes or more packs to try to put together a team set. Another thing about this set that I don't like is that I have no idea who the player is on the front of the card. The blurb on the front of the card should be about the player picture. 20 cards for $1, two of them numbered featuring 1st ballet Hall of Famers (I'm referring to Maddux and Piazza, sorry Roger). Not too shabby for only a buck!